A Vermont company is bringing that most unique and exciting of childhood experiences, the treehouse, back into fashion and aiding the wider community as they do so. Bill Allen has loved treehouses ever since he was a little boy. Throughout his childhood, he found pleasure both in building and playing high in the branches of his backyard oak. Upon the death of his father, he turned to a treehouse construction project as a means of grief therapy. Years later, a long-time friend contracted hepatitis C and sought Allen’s help maneuvering the psychological chaos the diagnosis imposed. The duo initiated a simple, therapeutic treehouse building project that grew into the not-for-profit venture, Forever Young Treehouses. Now retired, Allen has turned the reins of the organization over to James B’Fer Roth. As director and lead designer for Forever Young, Roth continues its mission of bringing “universally acceptable” treehouses to all people. During the design phase, the client obtains funding for the project, which averages $150,000, although costs increase when special features are added. “In Vermont, we built one for $50,000. On the other side, we built an insanely expensive one in Los Angeles for $750,000,” Roth says, explaining that the addition of ramps, platforms and adhering to earthquake zone regulations boosted the price tag. 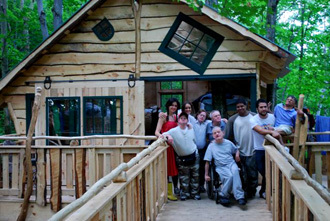 Zeno Mountain Farm in Lincoln, Vermont, has constructed four treehouses at the camp, which caters to “people of all ages and abilities,” according to director Peter Halley. “We can accommodate ten people in each treehouse. They have bathrooms with composting toilets. All are built with local wood harvested in Vermont,” he says. 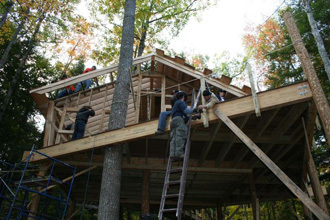 At Pine Tree Camp in Rome, Maine, approximately 1,000 individuals from the residential and day programs, as well as those who partake in spring and fall retreats, enjoy the treehouse experience. Anne L. Marsh, executive director of the Pine Tree Society, which operates the camp, praises the benefits associated with this unique opportunity. “The treehouse is a wonderful asset to any camp program,” she says. “It’s wonderful for people with mobility issues to be in the woods, to feel the sway of the tree, examine its bark and leaves.” She adds that the camp has developed a nature program around the treehouse that includes viewing various forms of wildlife from high above the ground. Building a treehouse provides obvious benefits to individuals with disabilities, but also offers rewards for the entire community. Marsh explains that a diverse group of volunteers provided much-needed assistance. “A local corporation lent a team of workers, and individuals who heard about the project came to assist. It was a great value-added effort,” she notes. Not all Forever Young treehouses are located in specialty camps. Some are situated in public gardens and parks where individuals with disabilities as well as those who are able-bodied can share in the excitement of the building stages and enjoyment of the completed off-the-ground adventure. 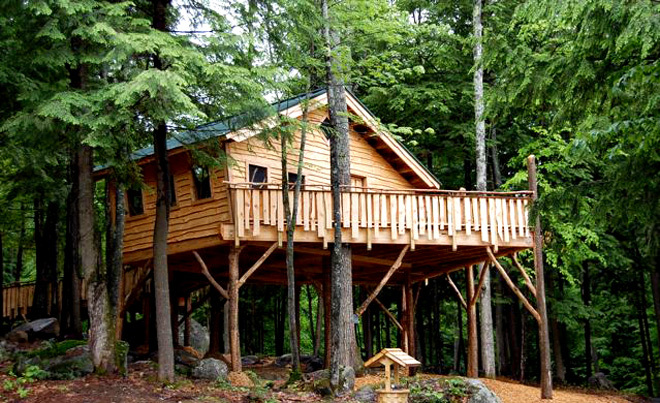 Forever Young Treehouses has spread its roots to sixteen states. Vermont leads the way with four and Illinois boasts two. 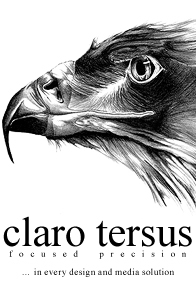 “We have a couple of new ones on the drawing board and one in the conceptual stage,” Roth reports. Allen believes that anyone – regardless of age, gender and physical and mental ability – should have the privilege of experiencing the magic a treehouse can provide. 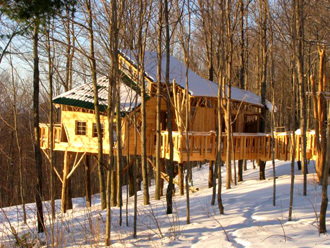 If they have their way, the team at Forever Young Treehouses will make this dream a reality.